Internet activists are kicking off 2018 with a bang by launching VoteForNetNeutrality.com, a no holds barred campaign calling on Internet users to vote en masse against lawmakers who refuse to overturn the FCC’s deeply corrupt repeal of net neutrality protections, using the Congressional Review Act (CRA). 29 Senators have already committed to support a CRA vote. Congress has the power to overturn the FCC with a simple majority vote in both houses using the CRA, which can be forced to a vote even without support from leadership. The vast majority of American voters (including 3 out of 4 Republicans) opposed the recent FCC move, taken just as lawmakers head into a close election year. Due to CRA rules, it is virtually guaranteed that every member of Congress will have to go on the record as either for or against. The campaign page displays a scoreboard showing which lawmakers have already signed on to vote for the CRA to overturn the FCC order, and which ones have not. 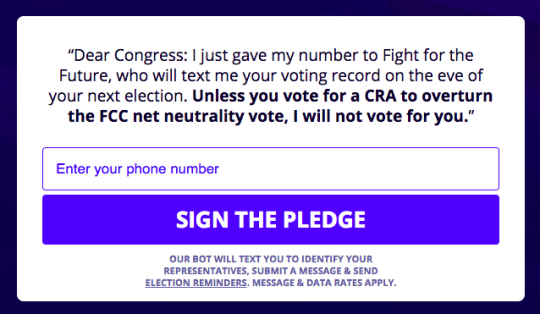 Once a voter signs the pledge, they’ll receive a text message on the eve of the next election with their local lawmakers’ net neutrality voting record, with a reminder to not vote for anyone who didn’t support net neutrality in the CRA vote. The fight for digital rights has matured into an election year issue. Millions of people from across the political spectrum who called on the FCC and Congress to keep the rules and were ignored will be taking their anger to the polls in 2018.